LET'S PARTY!!!!! so halloween is next weekend (boo!) & what's a better way to get in the spirit then throwing an apple on a stick & making a party out of it! today i am teaching you how to throw the ultimate caramel apple party. there are literally a zillion things you could dip, roll or drizzle an apple in. these are inspired by one of my favourite childhood treats from rocky mountain chocolate factory. 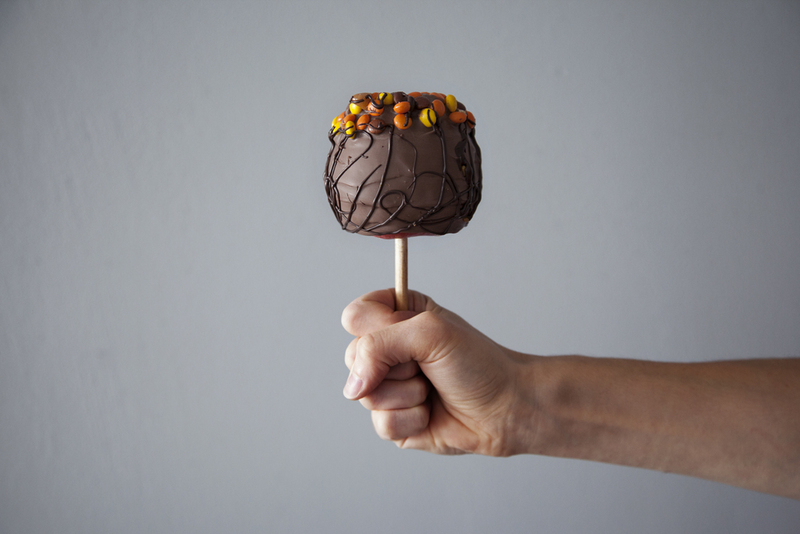 they make the most decident, fun & delicious chocolate caramel apples ever. 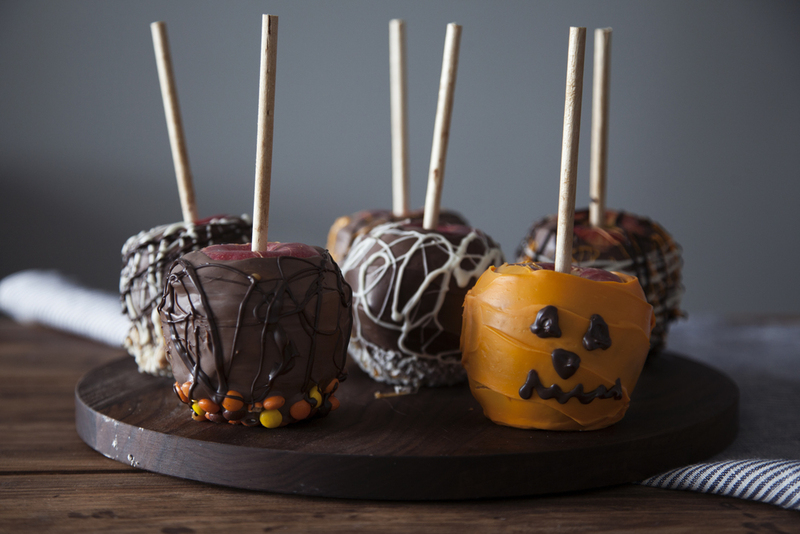 making caramel apples is perfect for a pre-halloween girls night in or to getting your little kiddies in the spirit. below is a list of what you need + the easiest two ingredient recipe for the perfect caramel dipping sauce! with all my left over chocolate & toppings i created a halloween chocolate bark (which you can see here). never ever let any ounce of chocolate go to waste! what are you doing to get in the halloween spirit? have you watched just about every horror movie on netflix like i have? what doesn't kill you makes you stronger, i think?! 8 candy apple sticks, twigs or popsicle sticks. apples, duh! 8 medium size apples of your choice. a bowl of caramel sauce (see recipe below). bonus points for salted caramel! four types of melting chocolate: milk chocolate, dark chocolate, white chocolate & orange chocolate. you will need a larger quantity of milk chocolate if you plan to dip each apple in it like i did. it seals in the gooey caramel. if you can't find orange chocolate, add yellow/red food colouring to white chocolate. as many toppings as you can possibly think of. i used coconut, salted peanuts, reeses pieces, mini chocolate chips, skor bits & halloween sprinkles. using a microwave safe bowl add your caramel squares & milk. place in microwave 2 minutes & stir. if the caramel is not melted enough, continue to microwave in 30 second incriments until a smooth consistency is formed.